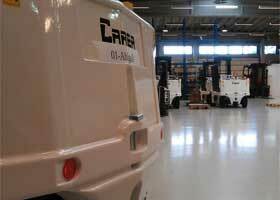 Carer was contacted by FROG, the leading Dutch AGV systems manufacturer, for an important project funded by a large overseas group operating in the metal processing field. By constantly keeping in touch with FROG engineers, our team made a forklift truck with a capacity of 4.5 tons. Later, the Dutch company implemented an advanced software system and turned it into an Automated Guided Vehicle (AGV), that is, an accurate instrument fitted with an automatic system to work without an operator. This is a job where the precision of Carer’s Technical Department provided a significant contribution to the success of the operation. Today, 14 of these automatic forklift trucks are used to handle aluminum blocks in Canada at very low operating temperatures (-25 C°) in saline environments.